The start of a new regime? 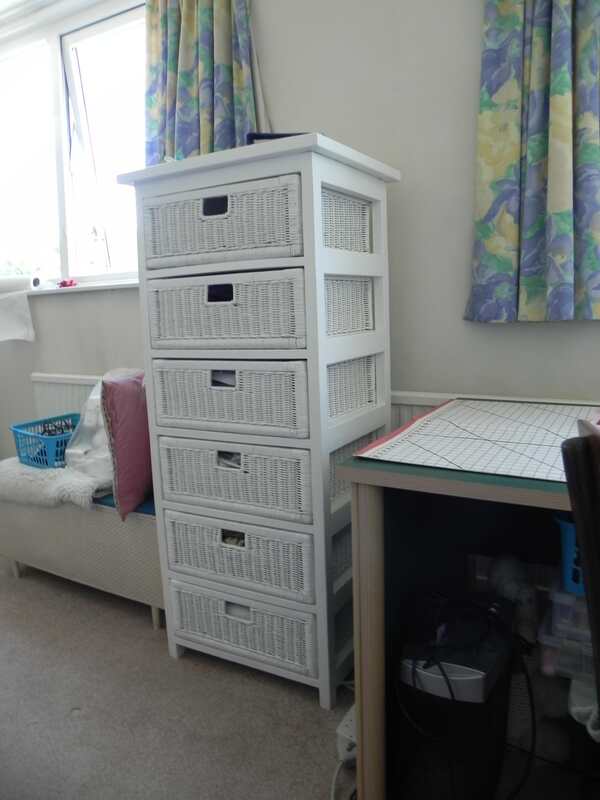 Impressed with other sewing rooms I've taken a hard look and decided moving clutter round is not the way to go. I found a bargain on Ebay, of something I have very similar in the conservatory for hiding rubbish (not mine I might add). Some muttering when it arrived more expense) but the young man even carried it upstairs for me. I've got another two corners to go but this is a good start. Found fabric I'd forgotten I had! The overlocker was going on top but a bit too high for me to lift it so got to find another home for it. The sewing machine will be on a tailor made table, narrower, but easier to move around to different places without dropping. I'm going to work on a new regime, everything to do with a new project goes in the left over baskets. Can't lose anything then, can I? I'd like to say no more fabric, but Clothspot had a remnant sale at the weekend and couldn't resist. Re: The start of a new regime? It is soooo comforting to know that someone works in the same way as I do. I see why you were willing to share the 'before' when the 'after' looks so good. I can't believe what a change it has made. Even though there are three other places to sort out, the room actually looks tidy. The back of the door currently holds clothes needing altering (taking in) or unfinished projects. It looks untidy so I'd thought of something like this or similar or another Izziwotnot. At least the Lakeland one could be dropped down when you didn't need it. It looks fab, can you come and help me with mine ? I did get up with every intention of tackling it this morning, as it was so warm I couldn't sleep and had a million things whirling through my mind and decided when first light came I would get up and start on it. Yeah right, it was too warm . I'm not really a sitter and do nothing kind of person so I had a cruise on the internet and decided to order a couple of lengths of linen to make something cooler to wear, after all we don't know how long this heatwave is going to last do we 藍.
Update: I shamed myself with this reply, I've just been in my sewing room and had quite a tidy up, it's not done with yet but it is now 10:50pm and I'm tired. I had a pricing look round and not wanting something that looked too much like it belonged in a shop, went for the Izzie. I've already got three that are extremely useful, given that they are for children's clothes. Also this was open box so reduced to £22, my kind of price. Another plus is that I can keep this in another room out of the way/sight, I've got too much stuff in as it is, that's part of the problem. Wish I had room for one G. I think it looks more stylish and less functional than the other. I have a metal rack I keep at work, wouldn't fit into anyone's 'scheme'. I've been side tracked recently, I want to sew, we're hospital visiting etc., so sewing time is short. 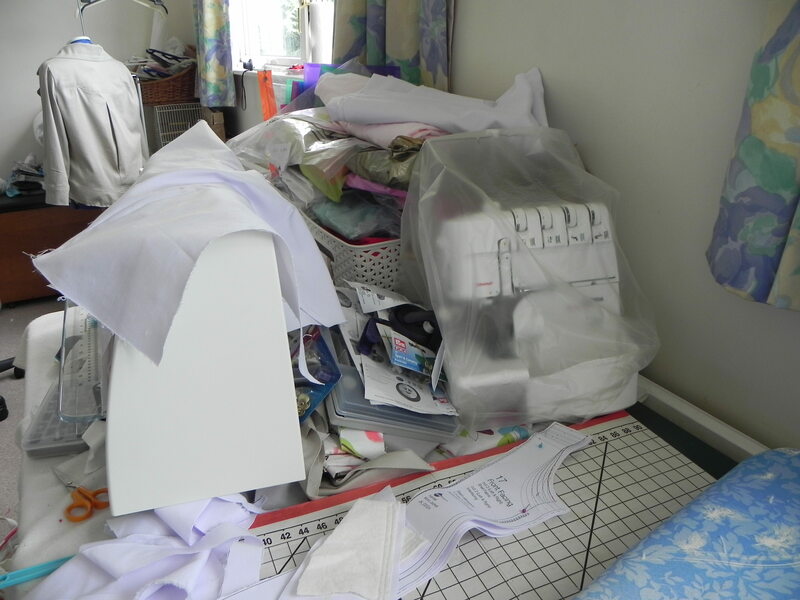 I'd cleared another corner but couldn't find a home for where things should go, it was hot and I was torn with the mess, the sewing and the Izzi that wanted putting together. Yesterday with 20 minutes to coffee time I dropped sewing and went to the Izzi. If I kept on sewing I'd forget about the time and DH out working would be waiting for the call for his coffee in vain. I'd counted the pieces already so everything was there and since I'd put two up myself I knew it was straightforward. It wasn't, I couldn't get the screws tight enough on the bottom piece and since I don't like asking for help until I'm desperate, I left it. Going back today I'd unscrewed and re-screwed still with the same problem, I hadn't got enough strength to turn and worse the pole/rod was turning as I tried to screw. some zip pulls since I couldn't see what I like. A 12 inch square remnant. Wrapped it round and turned the Allen key, it flipping worked straight away, hard to pull round but it was shifting. Gave me a red face but done. Still got the rest to do but at least I have the 'tool'. Still got a mess as well but getting there.